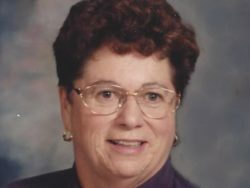 Mary Hilborn - Heritage Funeral Homes Inc.
of Drayton passed away Peacefully at Palmerston Hospital on Monday September 10, 2018 in her 87th year. Beloved wife of the late Douglas Hilborn (2017) of 61 years. Dear mother of Mark Hilborn and his wife Anna of Pittsburgh, Pennsylvania. Loving “Nana” of Erik and Olivia. Loved sister of Lois Hicks of Toronto, Sister-in-law of Louise Rew of Victoria Harbour and Pauline Robertson of Victoria B.C. Fondly remembered by her nieces, nephews and friends. Predeceased by her parents William and Ruth Hicks, brother George Hicks and his wife Jean and two brothers-in-law Robert Hilborn, and Joe Rew. The family will receive friends at the Heritage Funeral Home, 20 Wellington Street South, Drayton, on Wednesday September 12, 2018 from 7-9 p.m. Rev. Mark Laird will conduct the Funeral Service in the Drayton United Church on Thursday, September 13, 2018 at 11:00 a.m. followed by interment in Drayton Cemetery. As expressions of sympathy donations to Drayton United Church would be appreciated by the family. Peace Chapter # 52 Order of the Eastern Star, will hold a Service in the Funeral Home on Wednesday evening 6:30 p.m.